With a large, stunning display and a set of unique features not available anywhere else, the Samsung Galaxy Tab S is about to become your new favorite entertainment device. Here's a video showing you how to set it up and take advantage of some of its cooler features. The Samsung Galaxy Tab S is a true leader in its industry, offering unique features like Sidesync, WatchON, and multi-window. It also has one of the largest and best displays on the market, so watching movies and playing games is a real treat. Let's walk through the setup process. When you first power it up, your Galaxy will guide you through a series of prompts starting with Wi-Fi set up, followed by your Gmail account. If you already have a Gmail account, just login. Otherwise, you can create a new one. If you don't set up a Gmail account during the set up process, don't worry. You can always get to Gmail from your applications page. If you want, you can create a Samsung account to manage your apps and reward points. Swipe and move around to get comfortable with the flow of your tablet. With your Samsung Galaxy, you could actually use two applications at the same time. To do this, you'll have to make sure the multi-window function is enabled by swiping down from the top. The multi-window icon should be highlighted. To use this function, simply have one application open and swipe from right to left. Touch and hold the app you wish to open and drag it over. Notice you can place it on either side of the screen. To return to your home screen at any time, press the Home button at the bottom center. Next, check out the Samsung WatchON app. 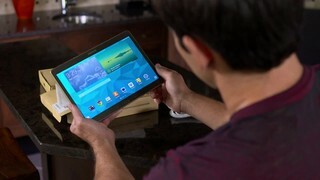 It allows you to use your tablet as a remote to your television. If you have an Android phone, you can use Sidesync from your tablet to share screens, windows, and data between the two devices. Thanks for taking the time to watch this video. If you need more help, we are here for you 24/7. Visit GeekSquad.com, call us at 1-800-GeekSquad, or visit us at a Best Buy store.